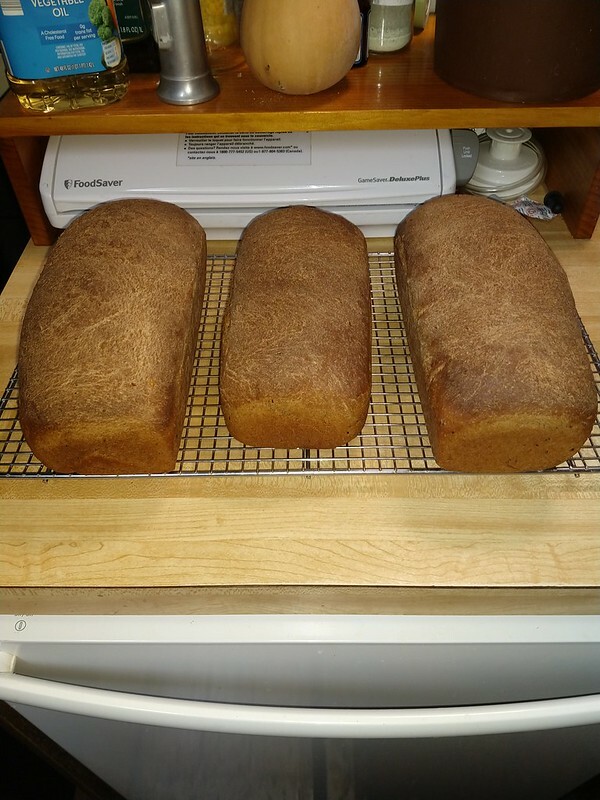 I made some bread today - good day for baking, since it was a cold, dreary day. 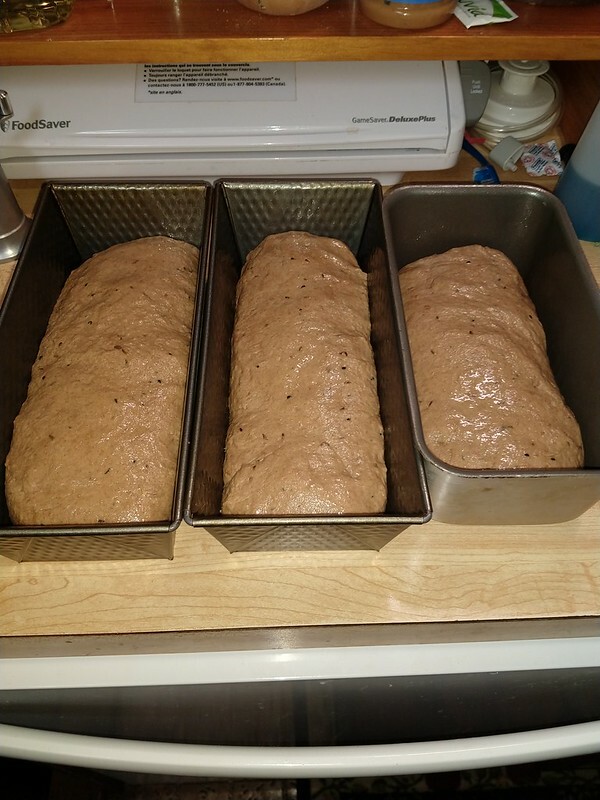 It was a Potato Rye, with some ground golden flax seeds in it, and I made it with some whey I had from making some Greek yogurt, so that gave it some tang. 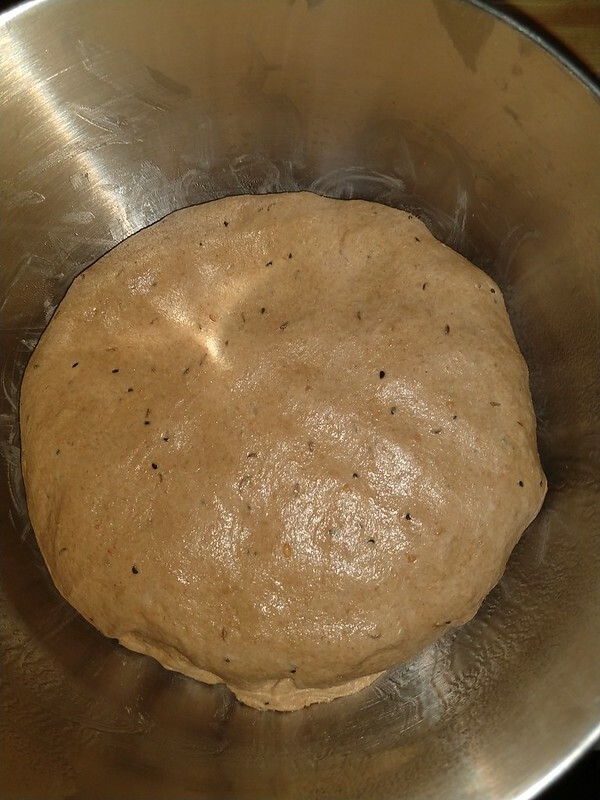 Not a two or three day bread - just a simple two rise bread, with almost all whole grain (the last cup of flour added to the bowl while "kneading" is bread flour, just so it doesn't get too dry). 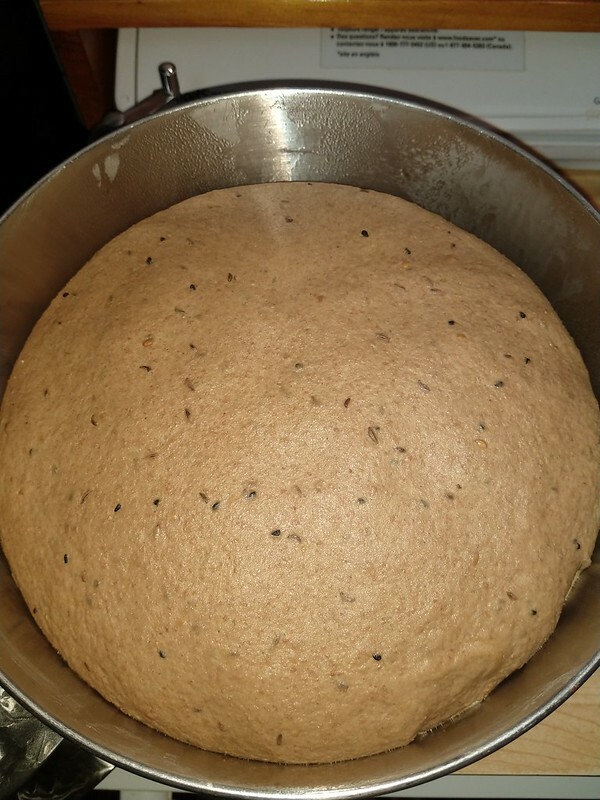 I also added a tb of nigella seeds, along with all those 2 tb of caraway seeds, so it's loaded with seeds! I got two 32 oz and one 26 oz loaf from this dough. One is going to a friend, and one in the freezer (this I'll do, even when trying to empty the freezer, as it won't stay in there long). 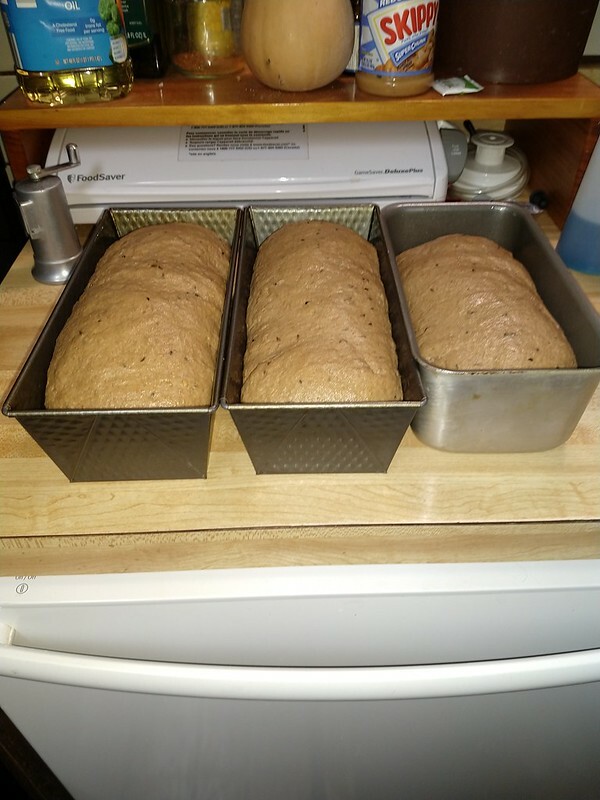 Funny thing about this - as usual, the smell permeated the entire house, and I smell it up here in my computer room, but it smells like I baked something like a sweet bread or cake, not a rye bread! Maybe wishful thinking? I love cooking it rarely make desserts or cakes. My daughter is a very good baker.and cook. I havnt made a dessert in months and months.i made 2 in the weekend, first called for 5 yolks so I kept the whites and made a pav. Waste not want not. Both were beautiful. 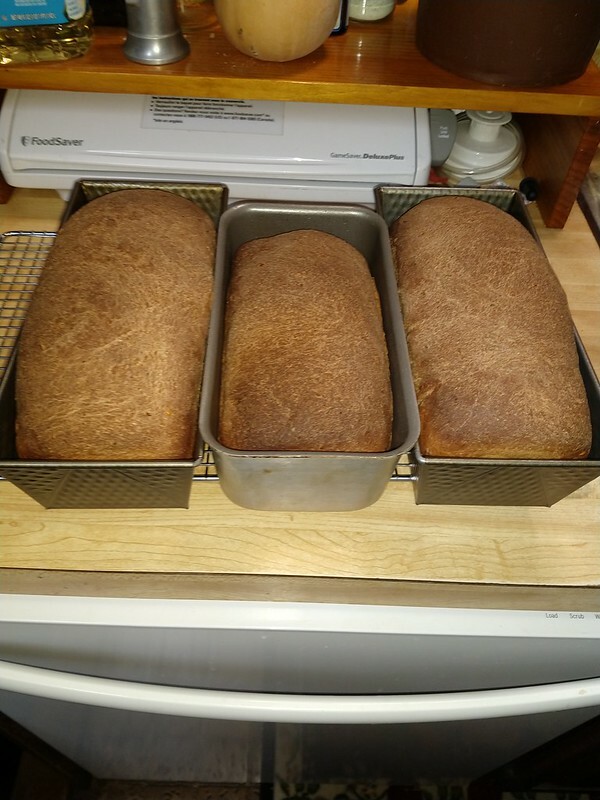 Saw a recipe yesterday for 90 Minute Man Bread and gave it a try this morning. Wow, wow, wow! Easy peasy and, of course, I streamlined it. 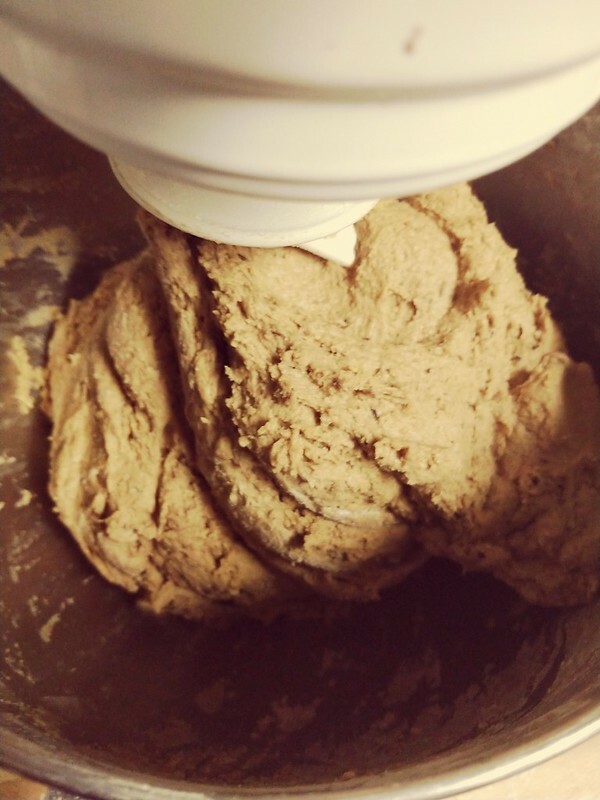 Used the ingredients just as called for but, instead of using my KitchenAid with dough hook, I put everything into the bread machine and set it to DOUGH. Only let it rise for 30 minutes in the machine as the recipe directed. Shaped it into a ball, pretty large one as it turned out. Then before putting it on a piece of parchment and putting it into the microwave for its final rise, I put a cereal bowl of water and heated it on HIGH for 4 minutes, which turned the "proofing" environment into a warm and moist place. Followed the recipe the rest of the way, placing the risen loaf onto a pizza stone and baked it. Beautiful! Gonna make another one tomorrow because this one isn't going to last long. How did you do the microwave proofing (time, power level)? Oh ok. I usually put a steaming hot pan of water on the bottom rack of oven then place dough on top rack to proof/rise. Both techniques work. If you use the microwave, though, you can preheat the oven for baking before the dough is finished rising. As I mentioned, I put the bowl of water into the microwave to heat on HIGH for 4 minutes. I do not remove the bowl. Doing this way, I can depend on at least an hour of proofing time.....that is, unless my husband opens it to reheat his lunch. Pepper you make me envious, I can't bake bread. Last 4 times epic failure. What's the skippy product on your shelf?